The beauty of Indian Cooking is its versatility combed with big flavors. No wonder it is one of the most famous cuisines in the world. I am surprised yet so glad to see Indian restaurants popping every where I see in the recent years. Many westerners are aware of our food. Of course misconceptions exists galore but that's inevitable. I am sure my take on say African or Caribbean cuisine would make a native cringe but as the time goes by and awareness increase, these obvious misrepresentation will go down. Coming to this dish, it is one among those which shows the versatility of the cuisine. 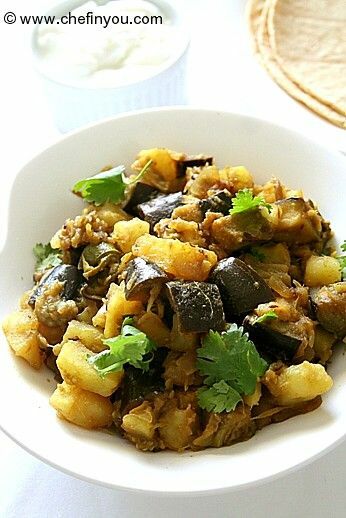 The permutation and combination of vegetables are GALORE and this dish highlights eggplant and potatoes together. Its a wonder how both these strong vegetables co-exist so well without taking away the credit from one another. Cooked with selective spices, these are flavorful and hearty. Since they are on the moist side (not completely dry nor gravy), they go very well with roti/tortillas. 1. 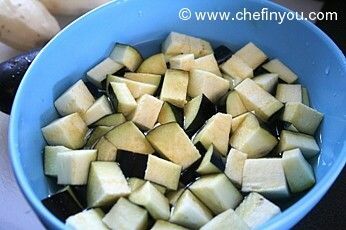 Just make sure to drop the cubed eggplant into a bowl of water. This is to prevent discoloration. Set aside. 2. Meanwhile in a skillet, add 1 tsp of oil. 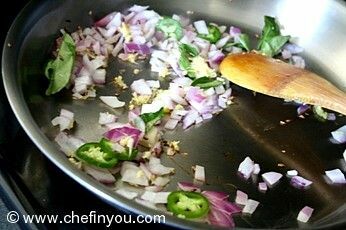 When hot add the cumin seeds, then chillies, curry leaves, ginger , asafoetida and onions. 3. 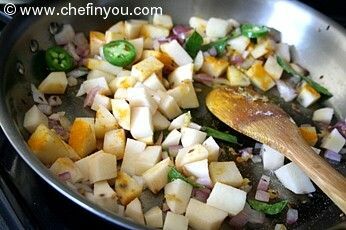 When onions get soft, add the potatoes along with salt and turmeric powder. Toss to coat. Sprinkle some water. 4. 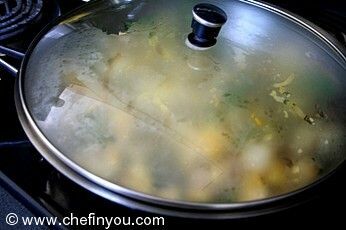 Close the lid and let it cook for 2-3 minutes. 5. 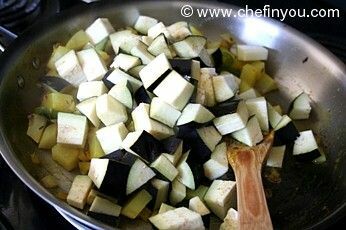 Then add the eggplant along with cumin-coriander powder and let it cook for another 8-10 minutes or until the eggplant is cooked. 6. Towards the end add the garam masala and mango powder (or lemon juice). 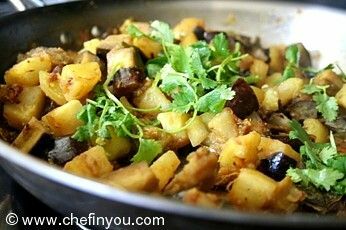 Toss well and garnish with cilantro. We enjoyed it with plain roti's and Greek yogurt. I love this. 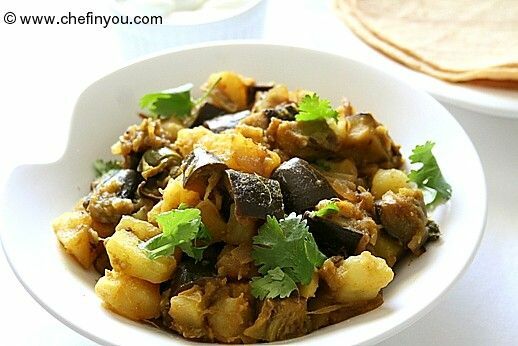 I have been a fan of potato and curry for a long time but the eggplant adds such a nice earthy sweetness. Really a great dish, even my teenagers (very picky) ate it without complaint. Went looking for a recipe to help me get through the produce from my garden, and I happened to have a backlog of potatoes and eggplants. Never had this combination before, but this dish is divine. I love the spice level, just on the right side of subtle. Thanks. And your introductory writeup was helpful, too. 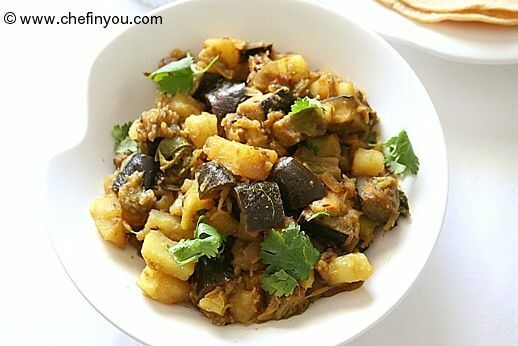 hey .. firstly thanku so very much for posting this recipe , my mom made ths while we were in india and i was never a fan of eggplant but tht exact day i fel in love and it was today tht i asked her abt it and coincidentally gng thrugh ur recipe , i came across this and i was lke thts dinner ....cant wait to see if my hubby likes it , to my taste it turned out great,....thx hun ! Looks perfect and delicious.. beautiful clicks ! !